June 15, 2014 – 1 pm – 8 pm The march starts at Millennium Square and goes to Olympic Plaza where we will praise, worship and exhalt Jesus Christ to the glory of the Heavenly Father, and where we will eat, laugh and partake in God’s blessings. March for Jesus brings Christians of every tradition, age, and color, into the streets to celebrate what Jesus has done and to ask God’s blessing on our cities. It is nothing more and nothing less than a joyous celebration of our Lord Jesus Christ. 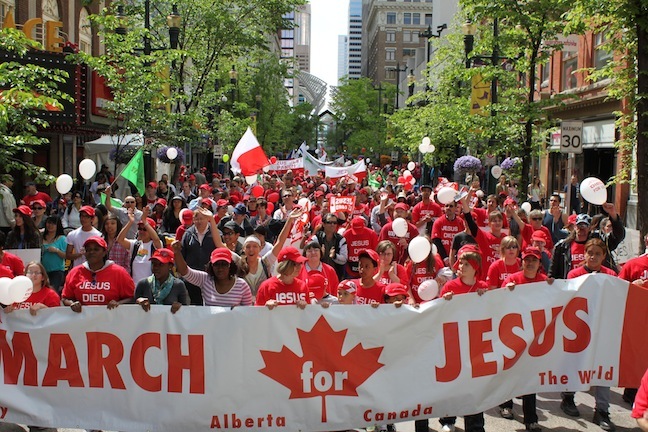 Please join us for the March for Jesus 2014 in Calgary, Alberta. Once again, the march will start at Millennium Plaza and will end at Olympic Plaza with celebration, praise, worship and prayer during the march and the celebration to follow at Olympic Plaza. We look forward to working with you to make the 2014 March for Jesus equally beautiful and, if God is willing, even more beautiful than last year. We are asking God to help us to refine anything that needs improving naturally, but we are asking, once again, for God to make this event a work of God, and not merely a work of men. We are so grateful to God for His tender mercies and for His permission to start the process for the 2014 march. Please share this event notification with all your friends and family both on facebook and you through e-mail. You can e-mail them and ask them to click “like” on the facebook March for Jesus page (http://www.facebook.com/pages/March-for-Jesus/330986356217). We are looking to start to put our volunteer list together and to have funds in place to run the upcoming March for Jesus seemlessly. We believe that we are to do our best and let God do the rest. On behalf of the March for Jesus 2014 Team. Ask and shall be given to you. May 21, 2014 Artur Pawlowski Comments Off on Ask and shall be given to you.